Variance decomposition refers to the breakdown of the forecast error variance for a specific time horizon. Variance decomposition can indicate which variables have short-term and long-term impacts on another variable of interest. Basically, variance decomposition can tell a researcher the percentage of the fluctuation in a time series attributable to other variables at select time horizons. For example, forecast errors for the inflation rate of a country can be made up of 50% shocks to the inflation rate, 20% shocks to the interest rates, 10% to the level of industrial output and 10% to shocks to the exchange rate at a forecast horizon of 1 year. These values are not fixed and as inflation develops across time the contribution of each of the variables mentioned on this metric can change. Another example is the % of a companies sales forecast error that can be attributed management changes, prices of inputs, marketing, macroeconomic conditions or a host of other variables. The objective of this post is to develop a mathematical framework for the explanation of a variance decomposition and then demonstrate an actual variance decomposition of Nicaragua’s inflation rate. A variance decomposition is calculated from the Vector Moving Average (VMA) representation of a Vector Autoregression [see previous post on VAR’s and Stability in VAR’s]. Calculating these percentage at different time intervals yields for all independent variables yields the variance decomposition of a time series. The screen above prompts for a display option. Variance decompositions are usually represented in table form, but one can select other graph options. Standard errors can be reported by using the Monte Carlo method. The forecast horizon as well as the factorization of the VAR model can also be selected. Once the options are selected hit “OK”. The forecast horizon is in months in the example above. The influence on past inflation shocks dominates in the short-term but eventually dies away about one year later. 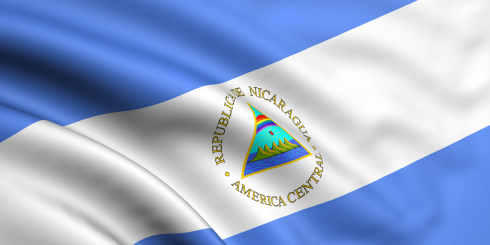 In the long-term the U.S. federal funds rate (US FF) and world commodity price index (WXP) contribute to over 60% of the inflation forecast error variance for Nicaragua. Domestic money supply, interest rates, and the exchange rate index become stronger in the long-run but are practically insignificant in explaining fluctuations in Nicaragua’s aggregate price level.